It’s raining now as it was twelve hours ago when I walked the one and a half miles from my home to Cullercoats Crescent Club. I’ve made the journey many times before. It’s a pleasant walk on a summer’s night but not yesterday when the rain ignored my umbrella and mac. I was drenched when I arrived so I hung my coat to dry on the radiator in the downstairs bar and chatted to members of Bay Uke who recently ran a successful, sold out ukulele festival in Whitley Bay. I’d marched through wind and rain last night to see The Good, The Bad and the Queen. You’ve probably heard about the tickets for three gigs here on the North East coast selling out in minutes. You might also have read the Crescent Club had to cancel a line dancing session to accommodate Damon, Paul and gang. Read it here in the one, the only Chronicle. Have you ever bought a ticket for a gig then revved yourself for weeks, days and hours ahead of the sacred event? Course you have. We’ve all felt like that but perhaps those gigs were decades ago? 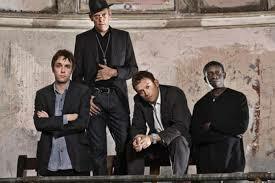 I was thrilled when I found out I had a ticket for The Good, The Bad & The Queen and enjoyed the build up to the gig. I listened to the band’s two albums and pondered what to wear on the night. Decisions, decisions. 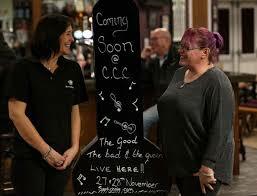 The gig was held in the Crescent Club’s upstairs function room, where the ukulele festival held sold out events earlier this month. After queuing and clearing security, I was relieved to see the tables and chairs in the function room had been set aside. This was going to be a standing room only gig. It was going to be a Proper Gig with flight cases stamped “Gorillaz” stacked around the edges of the room and a crash barrier at the front of the stage. The die hard fans were already at the front. They’d travelled from Germany, Italy and America. The fans work together saving places for their friends at the front when they need to nip to the loo. One fan had been delayed at Heathrow then had to navigate the Tyne and Wear Metro system. I was worried she’d miss the gig but she made it in time. I stood there from 7.30pm until the band came on at 9pm chatting to the die hard fans about Brexit and enjoying the pre-gig soundtrack of Dylan, dub and Nancy Sinatra. I chatted to locals too. This was a gig for us as well as fans from further afield. I didn’t take my phone and that’s why I haven’t got lots of out of focus shots of Damon or Paul S. I thought I’d leave that job for the folk to my right who seemed to enjoy watching the live gig taking place right in front of them via a small screen. Weird behaviour. I’ll never understand it. I didn’t need to take photos of the gig because I was at the front, two sweaty fans away from the stage. At one point the guy in front of me placed his hand on Damon’s bowed head, like he was blessing him. The room was full of fans who knew the songs by heart. Oh yes and a heckler. There had to be a heckler. When he shouted “stop patronising us, Damon,” our hero looked as bemused as we felt. The heckler was heckled back by the audience and then left with one audience member yelling “Nobody likes a heckler.” I’m not sure if he chose to leave or was asked to do so. The band were, are amazing. You don’t need me to tell you that about The Good, The Bad & The Queen. Last night they performed latest album Merrie England in order, had a break and then came back to perform several songs from the first album. No encores but then no self-respecting punk legend like Paul S would allow an encore, would he? My pre-gig chat with a European fan focused on the confusion many people feel about Brexit. Damon wasn’t patronising us last night with his songs. He was trying to connect with us and ask why so many folk in this part of Britain voted Leave two years ago. I’m as confused as the Euro fan about Brexit but I know a good gig when I experience one. More gigs like this at the coast, please! Mam, Nan, Anthea Redfern, Jaclyn Smith, and Anna-Maria Dragone. This is the list of female role models in my life from birth to the age of 10. Then there was Tracey Thorn. She helped me navigate the choppy waters between adolescence and teens. And she’s stayed with me ever since. I’d never seen or heard anyone like Tracey Thorn. I first encountered her on Pillows and Prayers, a compilation by Cherry Red Records. She featured on three tracks as solo artist and as a member of both The Marine Girls and Everything But the Girl. She was way, way cool. She called herself a Small Town Girl and I longed to claim Hatfield as my birthplace. Just like Trace. I spent most of the 45 minute show weeping, laughing and saying “yes! yes!” to my old radio. Tracey was talking to me. She made perfect sense but then she always has. She’s my super smart, sensitive, funny, warm heroine. Her words on anxiety are honest and the stories behind her choice of music are delightful to hear. Listen and learn. I was born and raised in Felling on the south side of the River Tyne. I lived there for the first 19 years of my life then moved away to university in Hull then work in London. I didn’t visit Felling for about 25 years. Once I started reacquainting myself with the place I came across two groups: The Felling Heritage Group and The Friends of Felling Park and Town Centre. Both are committed to honouring and preserving the town’s history as well as securing it’s cultural and social future. This weekend The Felling Heritage Group are holding their annual history exhibition in Coldwell Street Methodist Church. The group’s also organised a fall of poppies in Felling Square which will be officially opened by Gateshead’s Mayor today at noon. The poppy display is above the Soldier Seat, the permanent memorial to those who died in battle and on the Home Front. It’s just over two years since The Friends of Felling Park and Town Centre came into existence because of the reduction in central government funding to local councils. The group realised there wasn’t enough money available to maintain services through council funding. The group oversees the upkeep of Felling Park and the running of the libary on the high street. The group’s made a fantastic impact on the town but needs more help. Can you spare a few hours as a volunteer to help with the park? The regular sessions are better than a work out in the gym. I know. I’ve attended one of the sessions! The group is also looking for home gardeners and allotment holders to help with growing plants or donating spare seeds as the cost of planting through the year is very high. The Friends of Felling Park and Town Centre raises money for activity by applying for funding. This process is time-consuming and not always successful. That’s why the group is now asking individuals to consider making a monetary donation. It could be a one-off or a standing order. I don’t have the time to volunteer and that’s why I’ve just set up a standing order. I feel like I’m doing my bit for my home town. I also try and support their events. The library’s holding a Christmas Market and visit to Santa event on Saturday 8th December. I’m hoping to attend. I went last year and met Santa. He must be the real one, right? For more information about volunteering with or donating to The Friends of FP&TC then find them on Facebook and send them a message. Elaine and Santa, December 2017 in Felling Library.